Kura-kura leher ular kepulauan rote is a name to call this freshwater turtle species in Bahasa Indonesia. 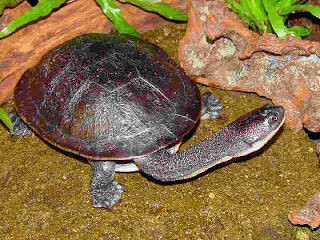 It belongs to the genus Chelodina (Australian snake-necked turtles) within the family of Side-necked turtles (Chelidae). Roti Island snake-necked turtle (Chelodina mccordi) is an extremely threatened turtle species from Rote Island south west of Timor and north of Australia. The carapace can reach a length between 18 and 24 centimetres. The length of the neck is similar. The color of the carapace is pale grey brown. Occasionally there are also specimens which have a chestnut coloured hue. The plastron is pale buff white. The neck is dark brown on the upperparts with round tubercles. The underparts are beige white. The iris is black surrounded by a white ring. Its habitat are swamps, rice terraces, and small lakes. 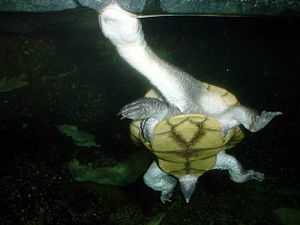 This freshwater turtle was split from the New Guinea snake-necked turtle and regarded as distinct species in 1994 after Dr. Anders Rhodin, director of the Chelonian Research Foundation in Lunenburg (Massachusetts), found out that there are differences between the two species. The first snake-necked turtles on Roti Island were discovered in 1891 by George Albert Boulenger. They were named for Dr. William McCord, a veterinary and turtle expert from Hopewell Junction, New York. A clutch can consist of 8 to 14 and it can have three breeding periods in one year. The size of the eggs is 30 x 20 mm and the weight can reach eight to ten grams. The first hatchlings come after three months, the last after four months. When they hatch they have a size of 28 x 20 mm and they have yellow spots on the plastron which become darker with the time until the plastron becomes almost black after a few weeks. During the growing period the coloring becomes more pale until they finally reach the color of the adults.